At Action Sheds Australia, our workshops are often used as combination workshops, storage sheds and garages. 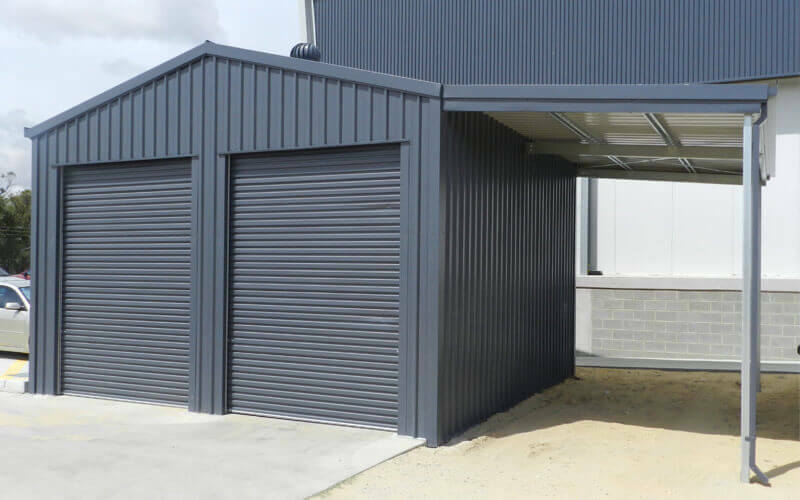 In Gooseberry Hill, a Perth suburb, we recently installed a 12 x 9m workshop for Walter S.
Walter wanted a shed that would house motor vehicles while also providing space for a workshop. He had one hectare of property, so we had plenty of room to find the perfect place for his workshop. Walter used one of our kits. He supplied a concrete slab for a foundation and then we erected the shed for him. Though the shed came as a kit, Walter needed the roller doors as close together as possible within the middle on the gable end. We designed the perfect solution and he was very happy with the results. We like to share positive feedback on this blog because we are proud of all of our happy customers. The feedback was very positive on every aspect of the job, from conception to ordering to installation. Walter was happy with the service he received, from myself and Jemma here at Action Sheds to everyone involved in erecting the shed. From our end, the installation went smoothly. The design team ensured that the two roller doors would be installed as closely as Walter requested. Better yet, the design team made the job easy. Our double roller door lock up workshop can be designed to any length, height or span to fit your needs. They are built in sections so that you can use one side for motor vehicles and the other side can hold a work bench, shelves and plenty of room to work. If you don’t want roller doors, we can also provide sliding doors. This will provide the largest space, maximising the width and height of the opening. We can also attach an awning to the side of a workshop, if you want parking but want to use the entire workshop. For custom needs, we can usually come up with a solution to your specific problem. At the very least, it is worth talking to our design team to see what we can do. Call 1300 778 628 to find out more about how we can provide a custom solution for your needs.